Hitchcock's first American film is sumptuous David O. Selznick production of Daphne du Maurier novel of girl who marries British nobleman but lives in shadow of his former wife. Stunning performances by Fontaine and Anderson; haunting score by Franz Waxman. 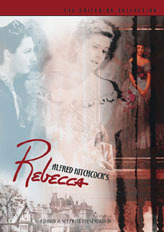 Screenplay by Robert E. Sherwood and Joan Harrison. Academy Award winner for Best Picture and Cinematography (George Barnes). The first film Hitchcock made in Hollywood and the only one that won a best picture Oscar (and even that went to the film's producer). 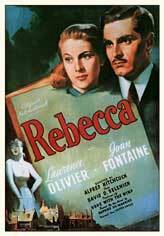 Just as in the original novel, Joan Fontaine's character has no first name. Hitchcock makes his cameo appearance walking past a phone booth just after George Sanders makes a call in the final part of the movie.